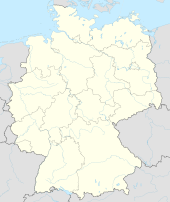 For ither uises, see Augsburg (disambiguation). Augsburg (German pronunciation: [ˈʔaʊ̯ksbʊʁk] ( listen)) is a ceety in the sooth-wast o Bavarie, Germany. It wis a Free Imperial Ceety for ower 500 years. It is a varsity toun an hame o the Regierungsbezirk Schwaben an the Bezirk Schwaben. Augsburg is a urban destrict an hame tae the institutions o the Landkreis Augsburg. It is the third-lairgest ceety in Bavarie (efter Munich an Nuremberg) wi a population exceedin 280,000 ceetizens. Efter Neuss an Trier, Augsburg is Germany's third auldest ceety, bein foondit bi the Romans as Augusta Vindelicorum. Augsburg is the anerly German ceety wi its awn legal holiday, the Augsburger Hohes Friedensfest, celebratit on August 8 o ivery year. This gies Augsburg mair legal holidays than ony ither region or ceety in Germany. Augsburg wis the hame o twa patrician faimilies that rose tae great prominence internaitionally an aw, replacin the Medicis as Europe's leadin bankers, the Fugger an the Welser faimilies. Frae 1266 till 1548, the terms Stadtpfleger (heid o toun cooncil) an Mayor wur uised interchyngeably, or occasionally, simultaneously. In 1548 the title wis feenally fixed tae Stadtpfleger, who officiatit for several years an wis then awairdit the title for life (tho nae langer govrenin), sicweys resultin ramfeesely, in records o twa or mair simultaneous Stadtpfleger. 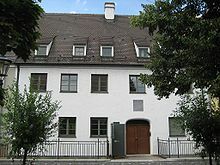 Efter the transfer tae Bavarie in 1806, Augsburg wis ruled bi a Magistrate wi twa mayors, supportit bi a addeetional cooncil o "Commonty Commissioners": the Gemeindebevollmächtige. As o 1907, the Mayor wis entitled Oberbürgermeister, as Augsburg haed reached a population of 100,000, as per the Bavarie Gemeindeordnung. Augsburg is locatit in the Wahlkreis 253 Augsburg-Stadt constituency, which includes Königsbrunn an the Destrict o Augsburg (Landkreis Augsburg). Christian Ruck o the CSU wis directly electit tae the Bundestag wi 49.2% o the vote in the 16t German Bundestag. Indirectly electit tae the Bundestag tae adhere tae the Landesliste wur Miriam Gruß for the FDP, Heinz Paula for the SPD an Claudia Roth for Bündnis 90/Die Grünen. The main road link is autobahn A 8 atween Munich an Stuttgart. Public transport is vera well catered for. It is controlled bi the Augsburger Verkehrsverbund (Augsburg transport union, AVV) extendit ower central Swabie. Thare are seiven rail Regionalbahn lines, five tram lines, 27 ceety bus lines an sax nicht bus lines, as well as, several taxi companies. The Augsburg tramwey netwirk is nou 35.5 km-lang efter the openin o new lines tae the varsity in 1996, the northren ceety boondar in 2001 an tae the Klinikum Augsburg (Augsburg hospital) in 2002. Tram line 6, which runs 5.2 km frae Friedberg West tae Rotes Tor, opened in Dizember 2010. Augsburg haes sax stations, the Central Station (Hauptbahnhof), Hochzoll, Oberhausen, Morellstraße and Messe. The Central Station, biggit frae 1843 tae 1846, is Germany’s auldest main station in a lairge ceety still providin services in the oreeginal building. It is currently bein modernized and an underground tram station is biggit underneath it. Hauptbahnhof is on the Munich–Augsburg and Ulm–Augsburg lines and is connected bi ICE and IC services tae Munich, Berlin, Dortmund, Frankfurt, Hamburg and Stuttgart. As of December 2007, the French TGV connected Augsburg wi a direct High Speed Connection tae Paris. In addition EC and nicht train services connect tae Amsterdam, Paris and Vienna and connections will be substantially improved bi the creation of the planned Magistrale for Europe. Stairtin in 2008, the regional services are planned tae be altered tae S-Bahn frequencies an developit lang term as integratit intae the Augsburg S-Bahn. Till 2005 Augsburg wis servit bi nearbi Augsburg Airport (AGB). In that year aw air passenger transport haes been relocatit tae Munich Airport. Syne then the Airport anerly serves for General aviation an business aviation. Augsburg is a vibrant industrial ceety. Mony global mercat leaders namely MAN, EADS or KUKA produce heich technology products lik printin seestems, lairge diesel ingines, industrial robots or components for the Airbus A380 an the Ariane carrier rocket. Efter Munich, Augsburg is considered the heich-tech centre for Information an Communication in Bavarie an taks advantage o its lawer operatin costs, yet close proximity tae Munich an potential customers. The local newspaper is the Augsburger Allgemeine first published in 1807. Thare are aseveral local radio stations an a local TV station (a.tv) an aw. 1442–1528 Erhard Ratdolt Printer, famous for haein produced the first kent printers teep specimen beuk. 1459–1525 Jakob Fugger Noted banker and financial broker. An aurie within the ceety, cried the Fuggerei wis set aside for the poor and needy. Foondit in 1519. 1460–1524 Hans Holbein the Elder, a pioneer in the transformation of German art frae the Gothic tae the Renaissance style. 1497–1543 Hans Holbein the Younger, portrait an releegious penter. 1517–1579 Paulus Hector Mair, mairtial airtist. 1580–1627 Julius Schiller, lawyer an astronomer. 1719–1787 Leopold Mozart, violinist-componer an faither o Wolfgang Amadeus Mozart. 1740–1786 Christoph Christian Sturm, German preacher an author. 1873-1964 Hans von Euler-Chelpin, co-recipient o 1929 Nobel Prize in Chemistry. 1858–1913 Rudolf Diesel, inventor o the diesel ingine. 1920–2011 Mietek Pemper, compiled an teepit Oskar Schindler's leet, which savit 1,200 Jewish preesoners frae the Holocaust. 1933–2011 Ulrich Biesinger, a umwhile German fitbawer, pairt o the team that wan the 1954 FIFA Warld Cup. 1939–2012 Helmut Haller, a fitbawer who representit Wast Germany at three Warld Cups. 1957 Bernhard Langer, famous profeesional gowfer. 1959 Bernd Schuster, a German fitbaa coach an umwhile player. 1961 Armin Veh, a German fitbaa coach. 1980 Benny Greb, a German solo drum airtist. 1985 Annina Braunmiller, a German vyce actress. 1989 Johnny Cecotto, Jr., a German racin career. FC Augsburg is a fitbaa team based in Augsburg an plays in the SGL arena. FC Augsburg wis promotit tae Bundesliga in 2011. The new stadium (opened in Julie 2009) hostit gemmes o the 2011 FIFA Weemen's Warld Cup. The ceety is hame tae a DEL (first-diveesion) ice hockey team, the Augsburger Panther. The oreeginal club, AEV, wis formit in 1878, the auldest German ice sport club an regularly draws aroond 4000 spectators, quite raisonable for German ice hockey. Hame gemmes are played at the Curt Frenzel Stadion: a recently rebuilt (2012-2013) indoor rink an modren stadium. An aw Augsburg is hame tae ane o the maist tradeetional German basebaw clubs, the Augsburg Gators. For the 1972 Olympic Gemmes in Munich, a Lech River dam protective diversionary canal for river ice wis convertit intae the warld's first airtificial whitewatter slalom course: the Eiskanal an remains a warld-cless venue for whitewatter competeetion an servit as prototeep for twa dozen seemilar foreign courses. While commonly cried Fuggerstadt (Fuggers' ceety) due tae the Fuggers residin thare, athin Swabie it is aften referred tae as Datschiburg an aw: which oreeginatit sometime in the 19t century refers tae Augsburg's favorite sweet: the Datschi made frae fruit, preferably prunes, an thin cake daich. The Datschiburger Kickers charity fitbaa team (foondit in 1965) reflects this in its choice o team name. ↑ "Stadt Augsburg - Home - Stadt Augsburg". .augsburg.de. 2014-05-01. Retrieved 2014-05-05. ↑ "Railway Gazette: Urban rail news in brief". Retrieved 2011-01-02. ↑ Martin, Douglas (2011-06-18). "Mietek Pemper, 91, Camp Inmate Who Compiled Schindler's List". New York Times. Archived frae the oreeginal on 24 June 2011. Retrieved 2011-06-26. Lewis, "The Roman Antiquities of Augsburg and Ratisbon", in volume xlviii, Archæological Journal, (Lunnon, 1891). Wikimedia Commons haes media relatit tae Augsburg.